Major snowstorm stranded skiers and canceled MLK Jr. Day celebrations in Utah. Salt Lake City gets hit with at least 8 inches. (Rick Egan | The Salt Lake Tribune) Tom Sawyer plays in the snow with his dogs, Tucker and Tanner, at Liberty Park, Monday, Jan. 21, 2019. (Rick Egan | The Salt Lake Tribune) Mark Fehlberg, and his kids, Desmond, Amelia and Kashmira, pull their sleds up the hill at Popperton Park, Monday, Jan. 21, 2019. (Rick Egan | The Salt Lake Tribune) Desmond Fehlberg 7, sleds down the hill at Popperton Park, Monday, Jan. 21, 2019. (Rick Egan | The Salt Lake Tribune) Randy Brown and 5-year-old Asher take advantage of the new snow to ski at Popperton Park, Monday, Jan. 21, 2019. (Rick Egan | The Salt Lake Tribune) Desmond Fehlberg 7, sleds down the hill at Popperton Park, Monday, Jan. 21, 2019. (Rick Egan | The Salt Lake Tribune) Mark Fehlberg, sleds down the hill with his daughter Amelia 7, and son Desmond, 7 at Popperton Park, Monday, Jan. 21, 2019. (Rick Egan | The Salt Lake Tribune) Mark Fehlberg, sleds down the hill with his daughter Amelia 7, at Popperton Park, Monday, Jan. 21, 2019. Utahns reveled in the fresh snow on Martin Luther King Jr. Day, a holiday for many, giving residents a chance to go sledding, build a snowman — or get stranded at a ski resort. The big storm dumped heavy wet snow in the valleys — and even heavier snow still in the mountains. Early snow totals include 8.5 inches in parts of Salt Lake City, as much as 18 inches in parts of Sandy, a foot in Tooele and half a foot in Murray. Some of the ski resorts in the state, including Alta, got up to two feet of powder. At about 1:30 p.m., a natural avalanche hit Little Cottonwood Canyon, which had already been closed. People at the ski resorts trying to drive down the canyon were instructed to return to Snowbird and Alta and stay inside. “In a situation like this when the roads are impassable, Snowbird has the means to accommodate people,” said resort communications manager Brian Brown. “The intensity of this storm was stronger than forecasted, but we’re prepared for situations like this." The restrictions were finally lifted just before 6 p.m., allowing people with four-wheel drive or chains to head home. The canyon was opened only to downhill travel. It reopened to all traffic at 8 a.m. on Tuesday after avalanche control. A avalanche warning remains in effect in the Salt Lake and Manti area mountains through 6:30 a.m. Wednesday. The Utah Highway Patrol — which responded to 234 accidents as of 9 p.m. — advised motorists to stay off the roads unless absolutely necessary. Eastbound I-80 at Parley’s Canyon and westbound I-84 in Weber Canyon near Mountain Green were closed for a spell, though conditions improved in the late afternoon. The snow even rained on the Martin Luther King Jr. Day parade, forcing cancellation of a planned march and rally at Westminster College in Sugar House on Monday morning, and a second march at the University of Utah in the afternoon. (Photo courtesy Salt Lake International Airport) Crews have been working to clear runways and de-ice planes at Salt Lake International Airport, which has experienced "minor delays" and three flight cancellations. The storm has also caused delays and three flight cancellations at the Salt Lake City International Airport. According to officials there, there have been more than 50 flights delayed between 30 minutes and two hours — largely because of the time it takes to de-ice the planes. Three flights were canceled. 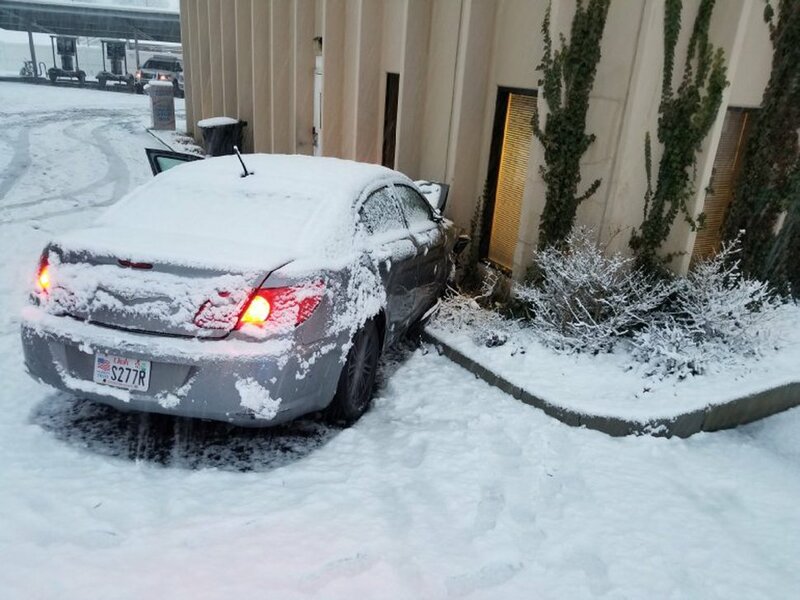 Weather may have contributed to an accident — or maybe it was the fact that the driver who struck the side of the Unified Police station in Millcreek was just 14 years old. The crashed happened at about 6:40 a.m. at 1580 E. 3900 South, and according to police, the driver and two other juveniles in the car were apprehended. (Photo courtesy Unified Police Department) A 14-year-old lost control of this car and crashed into the side of the UPD station in Millcreek on Monday morning. The snow tapered off in the afternoon, but the National Weather Service warned Utahns from Bountiful south to expect more of the white stuff. It is predicting up to an additional inch of snow overnight in the valleys; another 1-2 inches on benches; and 2-6 inches more in the mountains. Temperatures are expected to be in the upper 20s on Tuesday, with only a slight chance of more snow in the Salt Lake City area. But roads are expected to be icy and slick in the morning. Before the next storm arrives Wednesday, temperatures are forecast in the mid-30s.